Finding the best electric pressure washer might seem like a big task but in all actuality, it isn’t all that big of a deal. That’s because electric pressure washer manufacturers have continued to improve their products over the last few years and there are some really exceptional models out there. Models that can do just about anything the user needs them to do. What can the best electric pressure washer units do for your household cleaning? It can clean out gutters or siding, power away grease and oil stains off of the driveway and can be used to power through the stubborn BBQ stains of your favorite grill’s rack. Now, let’s take a look at some of the best models currently available. With an initial power burst of 3,000 PSI and a sustained working pressure of approximately 1,800 to 2,000 PSI at 1.6 gallons-per-minute, this model has more than enough power to blast through grit and grime quite easily. It’s designed with a total stop system which shuts the unit off when the trigger is released, thereby prolonging motor life and allowing the user to exert control over the pressurized stream. This model’s brush motor is built with a thermal sensor that senses when the unit is overheating and turns it off. Other grand features found on this cleaner include a folding handle, a GFCI plug and an automatic safety-valve. This washer is designed to give the user the pressurized power they need to get just about any home cleaning project done with ease, regardless of whether they are trying to remove oil from a driveway or tree sap from a car. This model is equipped with a total-stop system, an on-board reel with 20-feet of high-pressure hose and an 1800-watt motor that can generate up to 2,030 PSI at 1.76 gallons per minute. This unit also comes with a number of quick-connect spray tops which give the user a variety of options when they are using it for cleaning purposes. Designed to deliver 1,600 PSI of pressure, this washer has a variety of features which make it a useful machine to keep around the home. 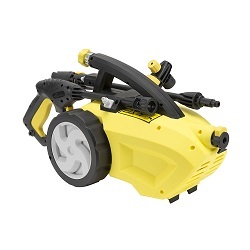 It has 20-feet of high-pressure hose, brass garden hose connectors, and comes with a number of attachments which include a pressure washer gun, a wand, a variable turbo nozzle lance, an extension lance and a 14-ounce detergent tank. And since this unit only weighs around 16-pounds, it’s easy to take from one part of the home to the other easily. This washer delivers over thirty times the pressure of a 50 PSI garden hose yet uses significantly less water. Designed to deliver up to 1,600 PSI pressure at 1.2 gallons-per-minute, this machine is useful for everything from washing a car to cleaning loose paint from the side of a house. It comes with a 20-foot high-pressure hose that gives the user the reach needed to do most jobs and a 35-foot power cord with an inline GFCI for safety. This unit can be used either vertically or horizontally and has a soap applicator for tough cleaning jobs. These features, along with its compact design, make it ideal for homes or apartments and can tackle a wide variety of tasks. This electric power washer might be small but it’s packing quite a bit of power. In fact, it delivers up to 1,500 PSI of power. Using 1.5 gallons-per-minute of cold water, this machine will power through messes on siding, lawn equipment, patio furniture, driveways or cars. This unit is quieter than gas-power washers and is more energy efficient than using a regular hose to clean. It comes with a 35-foot power cord with an equipped 35-foot cord and a number of attachments which include an angled nozzle, brush, telescopic rod and a turbo nozzle. Although it doesn’t look like a traditional electric washer, it has the power and the features a person needs to get their cleaning job done. It provides up to 1,600 PSI of pressure at 1.2 gallons-per-minute courtesy of a 13-AMP electric motor and a performance pump. It’s compact and lightweight but still manages to provide built-in storage compartments that are suitable for keeping nozzles and the spray gun organized. Another feature which can be found in this unit is a 32-ounce built-in soap tank that keeps the added cleaning power of the user’s preferred soap close at hand. Like other Sun Joe brand pressurized electric washers, the SPX300 is a nice blend of performance and power. It features a 14.5-AMP motor that provides up to 2,030 PSI of pressure and uses 1.76 gallons of water-per-minute. It is equipped with a total stop system which shuts the unit’s pimp off when the trigger is released to save energy and to protect the life of the pump. Other features which can be found in this unit include 2 0.9-liter detergent tanks, five quick-connect spray tips and both a cord and hose holder. Everything a person needs to use this machine for cleaning purposes. This washer can generate up to 2,100 PSI of pressure at 1.8 gallons-per-minute, which can really power through a number of different messes. It comes with a 20-foot high-pressure hose, a 35-foot UL-listed cord with a GFCI and a TSS (total-stop system) which shuts the washer’s pump off when the trigger is released. Its portable design makes it ideal for just about any cleaning job and makes it useful for cleaning up driveways, siding, or for washing the car. Other features which can be found on this machine include a turbo nozzle, an on-board hose reel, and a 25-degree nozzle. This 2-in-1 machine can be used with its accompanying mobile cart or can be used as a stand-alone unit, depending on the preferences of the user. Either way, it’s designed to provide the power needed to blast through most any job. It can deliver up to 2,050 PSI, which is approximately 40-times the pressure of a standard garden hose but uses up to 80% less water. This unit has a professional grade garden hose connector that’s made of brass to ensure leak-proof connections. This machine is ideal for cleaning cars, siding, BBQ grill grates or anything else that needs power washing. Equipped with a special feature known as Pressure Select Technology, this pressurized washer allow users to choose just how much pressure they need when they tackle a cleaning job. They can select a low pressure of 1,450 PSI for tackling light dirt and grime or can select high pressure at 2,030 PSI for extremely tough cleaning jobs. Some of the features which can be found on this unit include an on-board hose reel, a 20-foot high-pressure hose, a 35-foot power cord and 5 quick-connect spray-tips which can be used for different tasks. It’s an ideal unit for powering through all kinds of household tasks.